The Sri Lankan government has been the most successful in Asia when it comes to managing the current currency depreciation crisis affecting countries in the region, Finance and Media Minister Mangala Samaraweera said yesterday. Addressing a media briefing at the Sirikotha UNP party headquarters, the Minister explained that the Central Bank had successfully limited spending of foreign reserves to USD 250 million in order to manage the depreciation of the rupee to the dollar. 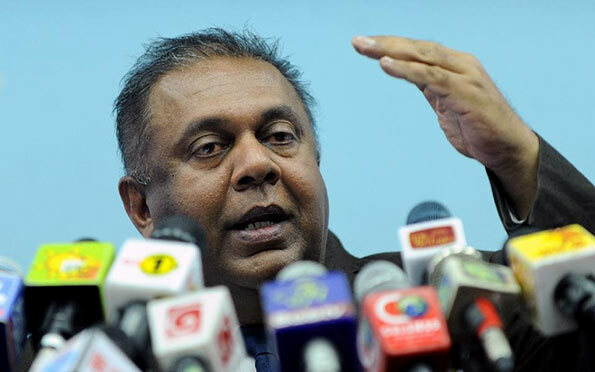 “In comparison, in 2012 when the rupee had depreciated by 14 percent in three months, the Mahinda Rajapaksa regime had spent USD 4 billion to stabilize the rupee against the dollar,” Minister Samaraweera said. The Sri Lankan Rupee which stood at Rs 170.60 to the dollar on Monday (8) dropped to Rs 172.34 to the dollar yesterday. Explaining the reasons for the current rupee depreciation, Minister Samaraweera stressed there was no correlation between the falling rupee and the state of the economy. “It is only the Joint Opposition which is using the rupee to spread rumours that the economy is failing.That is false. I would like to say that our economy is stable and it will not collapse under our watch,” the Minister said. The weak rupee, he further said ,would not affect the lives of the average people who do not depend on imported goods for their daily needs, “People who eat rice, some vegetables and fish from their village won’t be affected by this”. The increasing fuel prices, I admit may have an impact,” he added. “This proves that our vision for an export oriented economy is right. If we take that path, we will not be affected by currency fluctuations,” Minister Samaraweera said. “We can no longer afford car permits and I think we have come to a point where we can put a stop to it. Even new MPs will not be given any car permits,” he stressed. When asked about whether the decision to provide government servants a salary increase of Rs.10,000 was wise at a time when the government had just taken over a failing economy, the minister said; “I don’t think it was wrong as public servants had not been given an increase for 10 years, but if I was the Finance Minister at the time, I wouldn’t have given such subsidies. In hindsight we gave too many subsidies,” the Minister added. Why should Parliamentarians travel in luxury vehicles? Why can’t the use Tuk-Tuk’s? Yahapalana is the best in the world, upside down of course, with the lowest dollar value. I love you Guys, Mangy and his boss and Mendis Arakku Sujeeva and Maliki, wonderful leaders. Where are you talking from? Hole on the top or the bottom machan????? ?